According to the Buddhist tradition, Maitreya is a transcendent bodhisattva (or an enlightenment being) who will be the universal Buddha in a future age appearing on Earth in the future, achieve complete enlightenment and teach the pure dharma. According to scriptures, Maitreya will be a successor to the present Buddha, Gautama Buddha (also known as Sakyanumi Buddha). 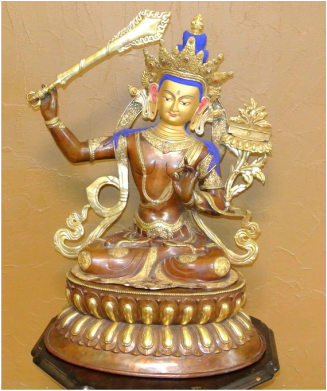 The prophecy of the arrival of Maitreya refers to a time in the future when the dharma will have been forgotten by most on the terrestrial world. Here Budhisattva is shown seated on the earth in a meditative position with a golden sword in his hand to fight the evil powers.